This post was written by my husband, Mike! According to a study Anna made up, 80% of women readers enjoy when a blogger’s husband contributes to special posts. Anna asked me to step in and write one for all you folks, and considering I spear-headed this little BBQ endeavor, I figured I would oblige her. I love cooking. In point of fact, I love grilling. I feel grilling is an area in which every man should be well versed, but rather than just mere grilling, this post will go one step deeper into smoking a pork loin. Last Friday I told Anna I wanted to smoke a pork loin over the weekend. I decided to go with a pork loin because I know it is something Anna likes. 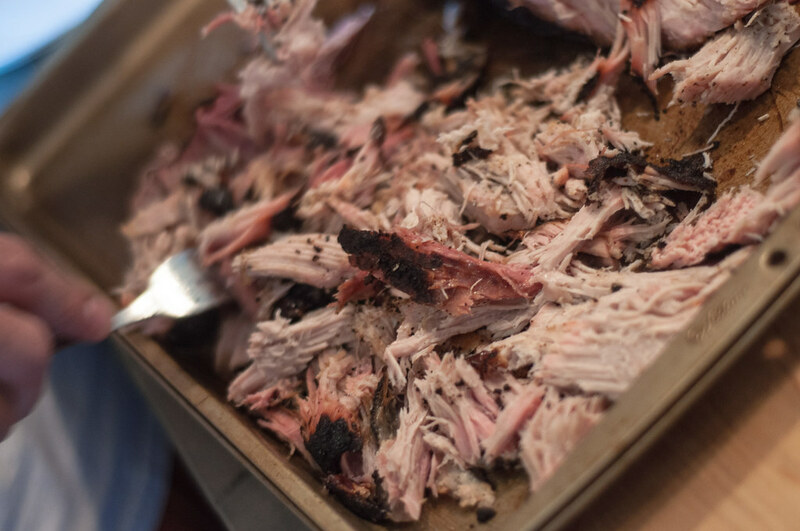 It’s pretty lean for a smoking meat so there are a few steps you can take to ensure great flavor and a juicy finished product. I like to start off with a brine. 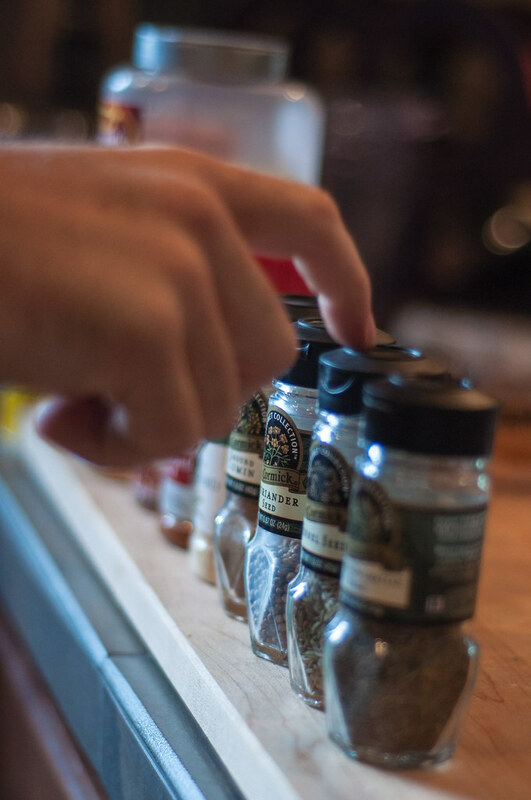 The process of any barbecue should ultimately be uniquely your own, but I tend to prefer salty and spicy flavors over sweet, so for my brine I use water, salt, molasses, and a few bay leaves. 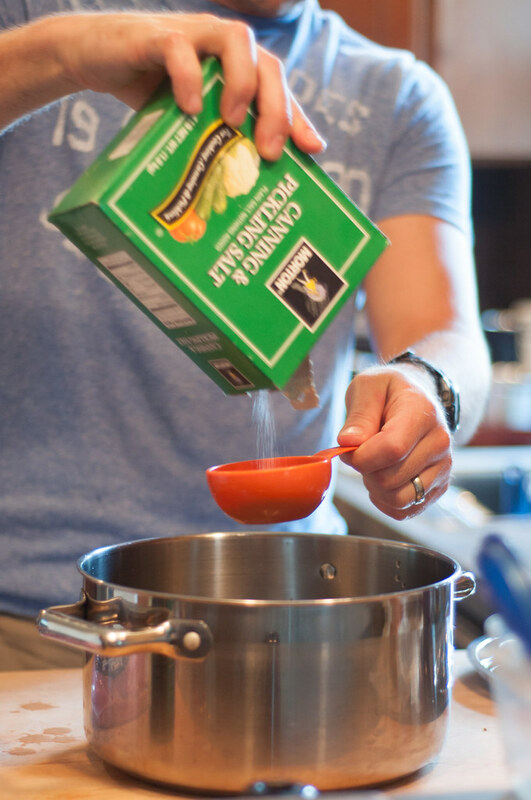 Keep in mind the brine (along with any other recipe) can be tailored to your own specific taste. 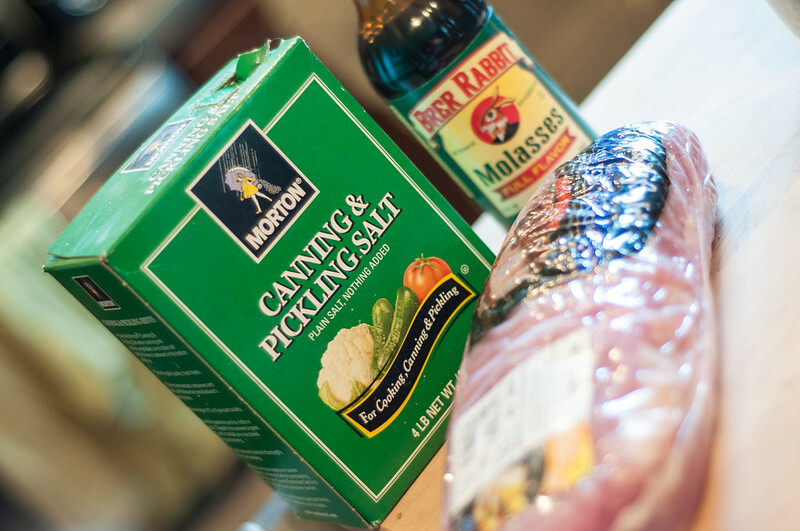 I use pickling salt because it’s very fine and dissolves easily in cold water. 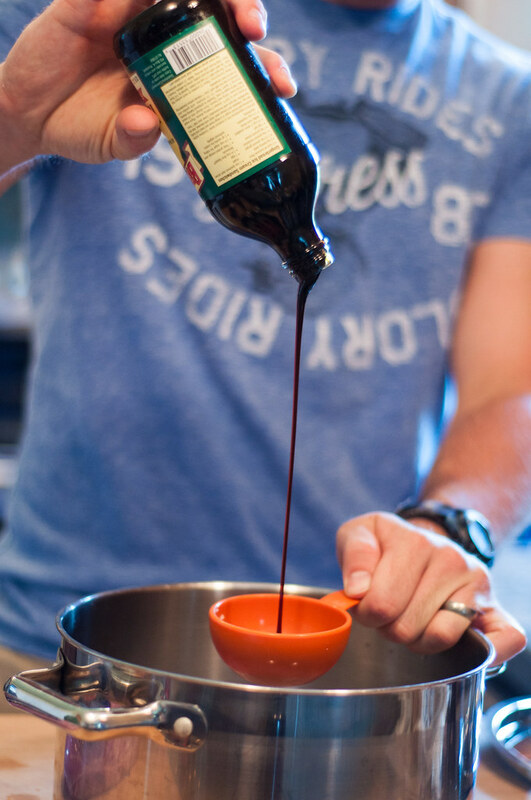 Molasses is sweet but not overpowering and it serves as a nice contrast to other flavors. I like bay leaves because they provide an herby and earthy flavor. If you desire something sweeter, you might consider brown sugar or honey. 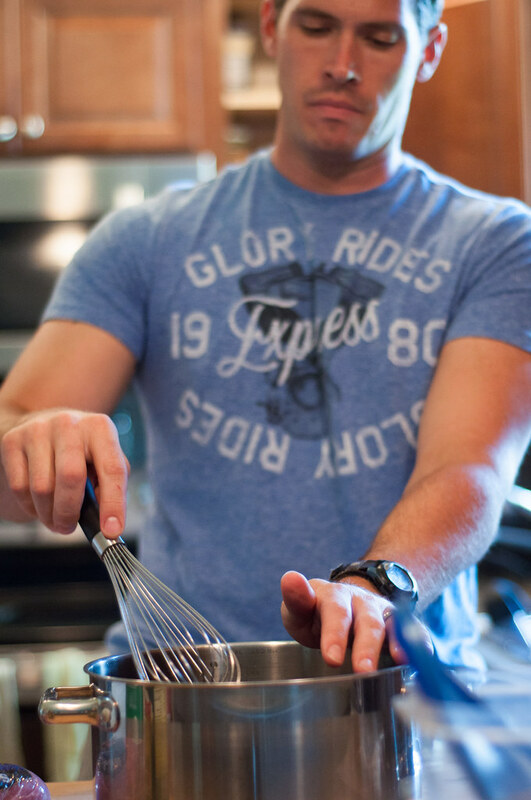 You should start the brining process between 6 and 12 hours before you plan to start smoking. 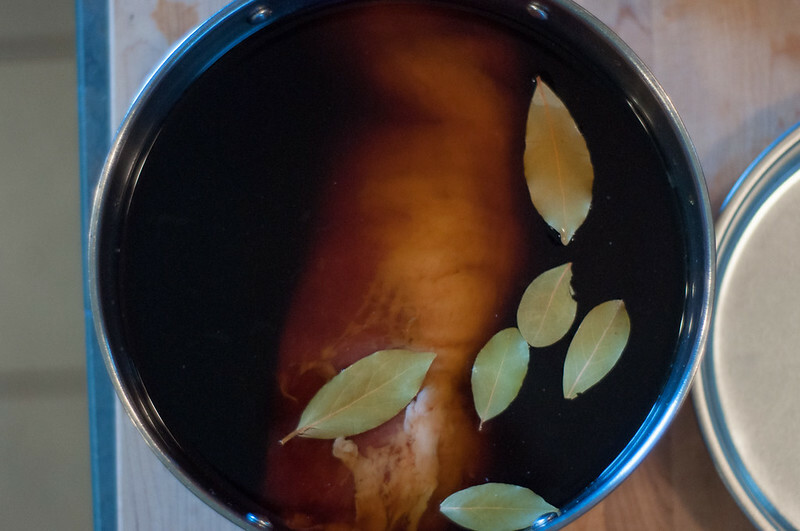 Mix the brine in a large pot, add the meat, cover, and refrigerate. If you use something as lean as a pork loin, you definitely want to use a brine because it will help keep the meat from drying out. Next I use a dry rub. Play around with it a bit until you find what flavor combinations you like. 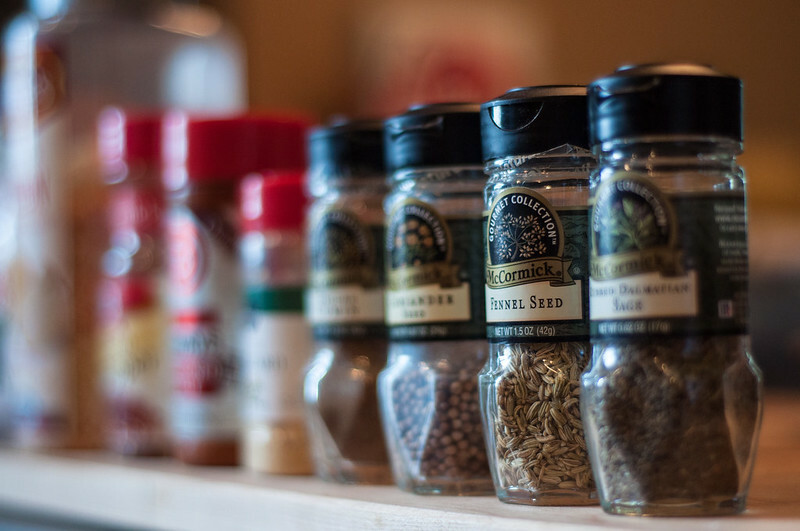 I use whole spices rather than pre-ground because the flavor is much fresher. 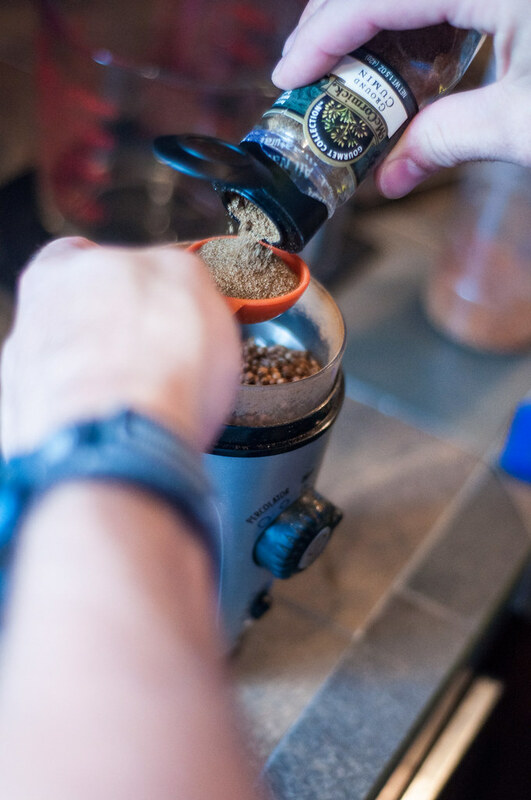 I have an electric coffee grinder I bought years ago and I use it just for making dry rubs. I use equal parts for the ingredients, and to be honest they change from mixture to mixture since I have never bothered to actually write it down. I use about 12 ingredients, 1 tablespoon of each. Once you’re done soaking the meat in the brine, season the loin generously with the rub on all sides, cover the entire surface and then shake off the excess. Place on a cookie sheet and cover with tin foil. Let it sit until it comes up to room temperature. 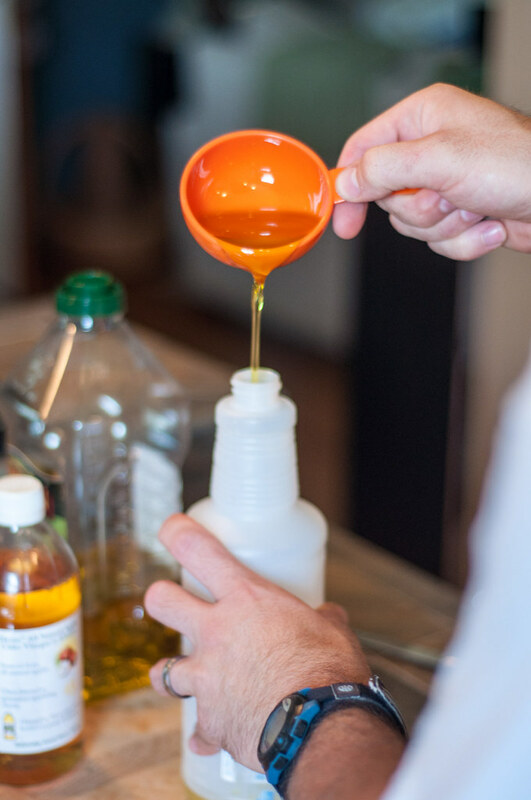 While the meat is smoking, you’ll want to spray it down once an hour with a mixture of 50% oil and 50% Apple Cider Vinegar. This helps flavor the meat and keep it moist during the smoking process. 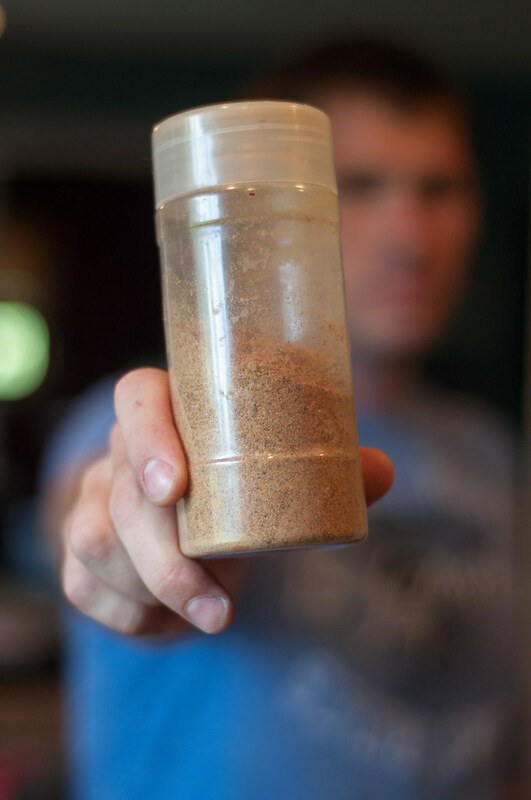 While you’re letting the meat rest, you may go ahead and start prepping your smoker. 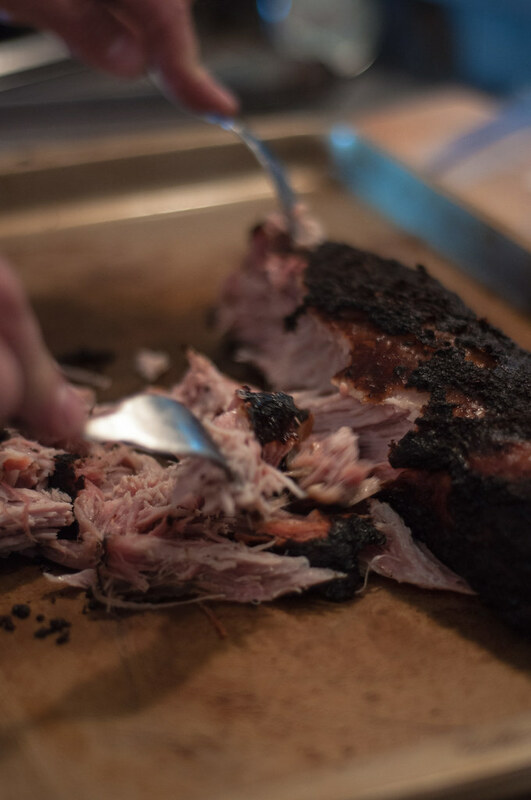 You want to get the temperature of the smoker to between 210 – 220 degrees Fahrenheit before putting in the meat. 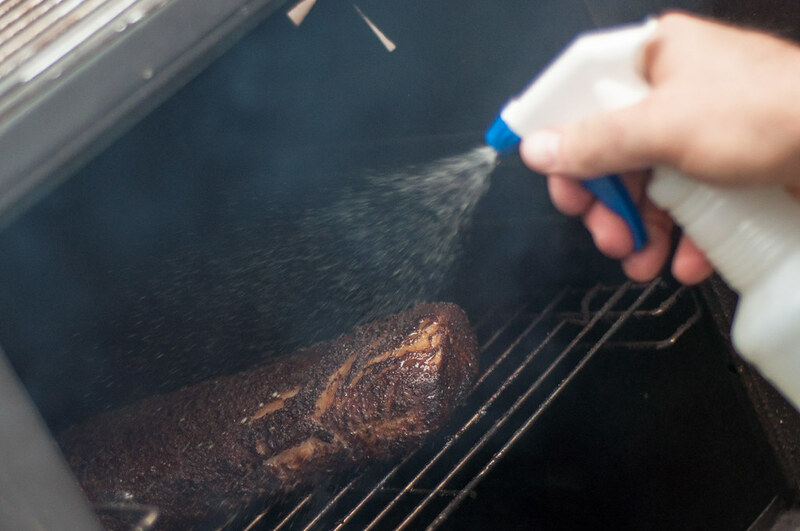 If you’re using a charcoal smoker, you have your work cut out for you. 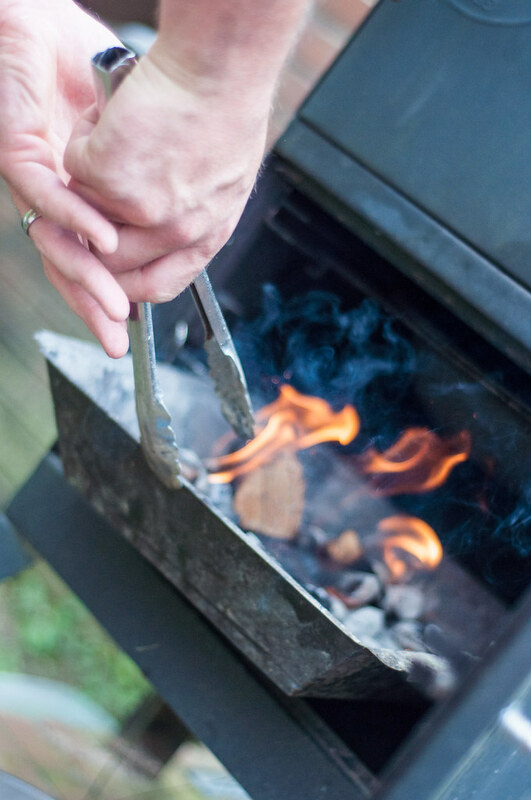 With charcoal, the temperature will either be rising or falling constantly; it will never just stay at a consistent temperature. Your job is to control the rise and fall as best you can to keep the temperature within that desired range. You want it between 210 – 220 because that is the ideal spread in which the connective tissue of the meat will begin to break down, leaving you with a finished product that will fall apart and melt in your mouth. If the temperature strays too high above 220, the meat will cook too fast and you’ll end up with a dry and crunchy pork loin. If the temperature hangs too low, you won’t achieve that connective tissue break down and your meat will end up tough and chewy. 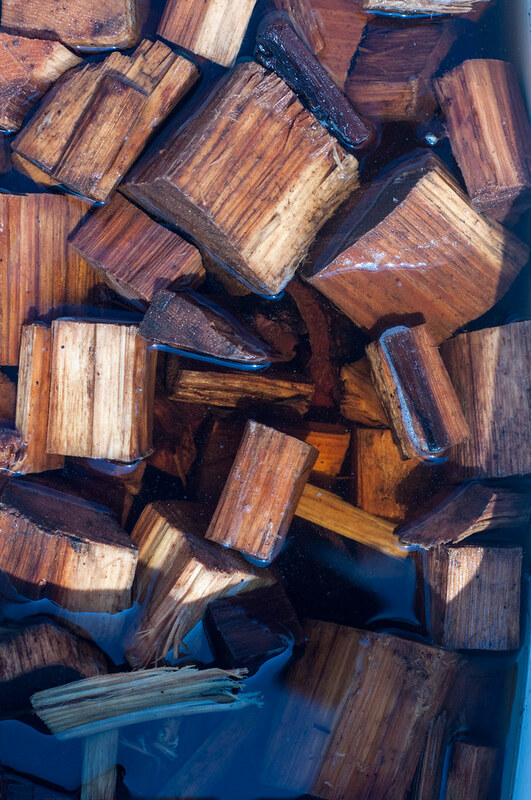 It’s actually quite a bit of work, so grab a comfortable chair, a six pack of your favorite beverage, and a bucket full of soaked hard wood (I use hickory for pork) and start cooking. 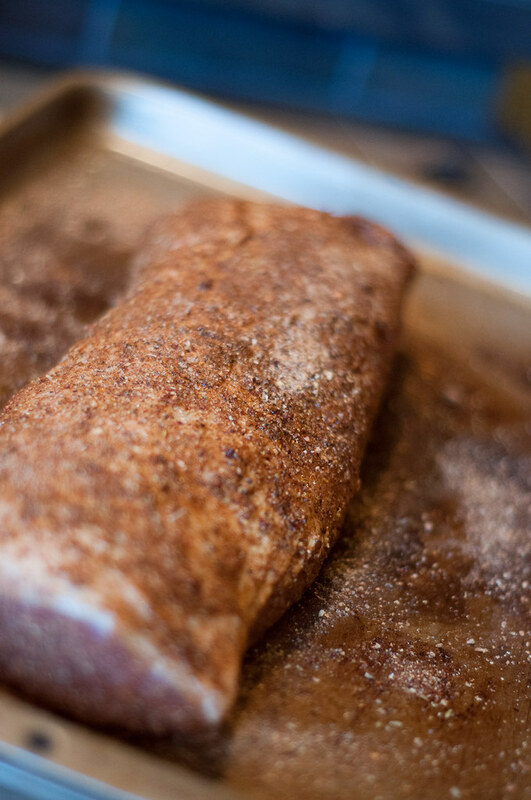 For pork loin, you want to smoke it for about 30-45 min per pound. When you start approaching the end of your calculated cook-time, you can go ahead and check the internal temperature of the meat. Push your thermometer into the center of the meat at one of the thickest parts. Try to only check the temperature once if you can manage, and leave the thermometer in once you put it in there. If you pull it out, you will have a geyser of juice flowing from the pork and will lose a lot of your natural tenderness. If the thermometer doesn’t read 180 degrees, then you’ll have to pull it out so you can continue smoking, but try your best to avoid that. 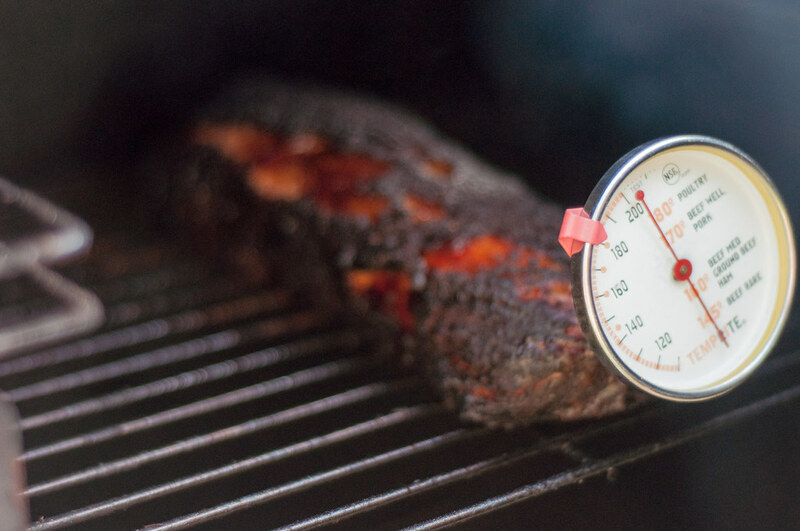 If the thermometer reads 180 degrees Fahrenheit then you’re ready to remove the meat from the smoker. At this temperature, the meat should shred apart easily using two forks. If you see a nice pink ring in the meat, that means the smoke penetrated outer layer – it’s a very good sign! 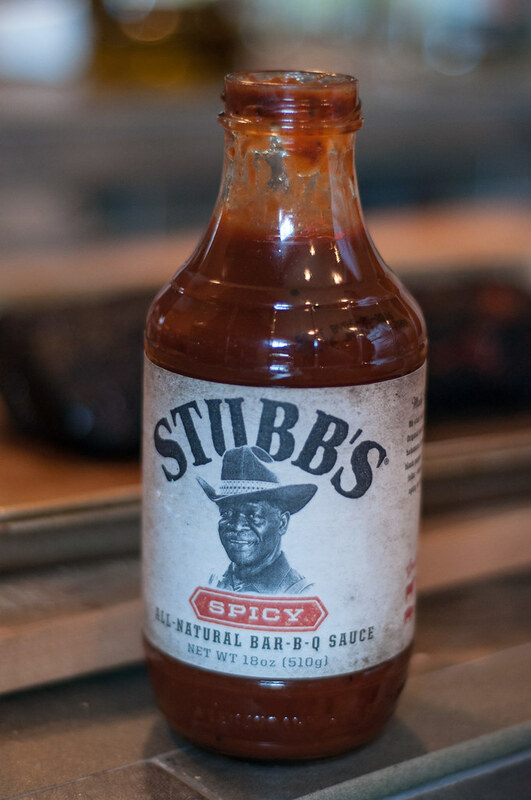 Now just add your choice of barbecue sauce, slap it on a bun, and enjoy! 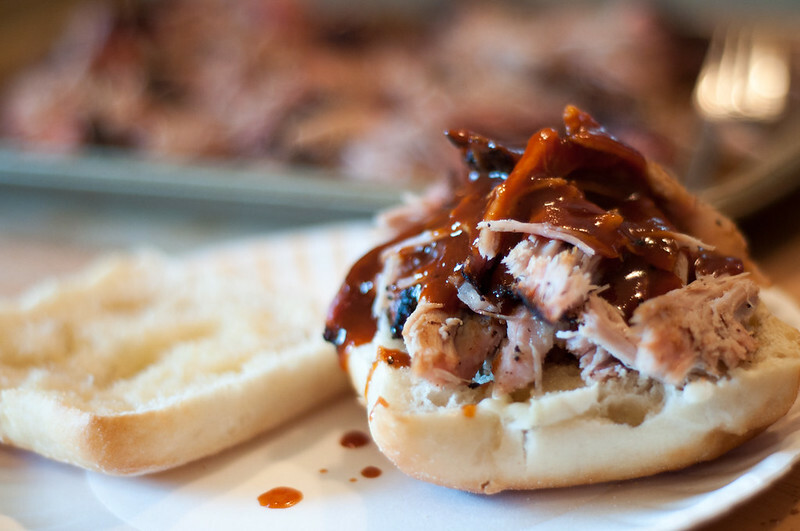 You Mom would love to try your smoked bbq. Invite her over sometime. I know it will be delicious!